Slashed Follow along Tinsley Tranfers tutorials on YouTube! 3D FX Transfers, the revolutionary new prosthetic. This technology garnered Tinsley Transfers an Academy Award for Technical Achievement. Easy to apply, self blending, no need for any glues or messy adhesives and looks absolutely real. Compliment the 3D FX Transfers with our Trauma Tattoo FX. Devil Horns Follow along Tinsley Tranfers tutorials on YouTube! 3D FX Transfers, the revolutionary new prosthetic. This technology garnered Tinsley Transfers an Academy Award for Technical Achievement. Easy to apply, self blending, no need for any glues or messy adhesives and looks absolutely real. 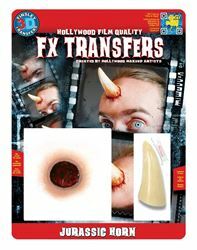 Compliment the 3D FX Transfers with our Trauma Tattoo FX. UniHorn Follow along Tinsley Tranfers tutorials on YouTube! 3D FX Transfers, the revolutionary new prosthetic. This technology garnered Tinsley Transfers an Academy Award for Technical Achievement. Easy to apply, self blending, no need for any glues or messy adhesives and looks absolutely real. Compliment the 3D FX Transfers with our Trauma Tattoo FX. Jurassic Horns Follow along Tinsley Tranfers tutorials on YouTube! 3D FX Transfers, the revolutionary new prosthetic. This technology garnered Tinsley Transfers an Academy Award for Technical Achievement. Easy to apply, self blending, no need for any glues or messy adhesives and looks absolutely real. 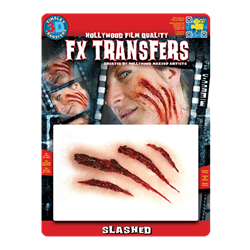 Compliment the 3D FX Transfers with our Trauma Tattoo FX.